Beyond the controversy and wild and crazy antics “The Gang” manages to get into regularly, there’s a common overarching them running through nearly every episode of the show: drugs and alcohol. If you’ve ever noticed how unrealistic or even downright scary some of the gang’s consumption of alcohol or substances seems to be, you’re not alone. We reviewed every episode in the first 12 seasons of “It’s Always Sunny in Philadelphia,” and chronicled every use or mention of drugs and alcohol. Think you know how many times beer comes up? Or which substances each character seems to have a penchant for? Keep reading to find out. “It’s Always Sunny” focuses mainly on “The Gang” (Charlie, Dennis, Dee, Mac, and Frank). While the group certainly has its vices when it comes to drugs and alcohol, the characters might not be their own worst enemies when it comes to excessive consumption. Some episodes (like “ Chardee MacDennis: The Game of Games”) may stand out as exceptions to the rule, but the combined rate of consumption or reference to drugs and alcohol was significantly higher when the show included more characters in a single episode. When left to their own devices, “The Gang” managed approximately nine mentions in each episode, or one nearly every two minutes. When surrounded by friends (or enemies), that rate increased to about 16 per episode or almost one every minute of each episode’s 22-minute runtime. 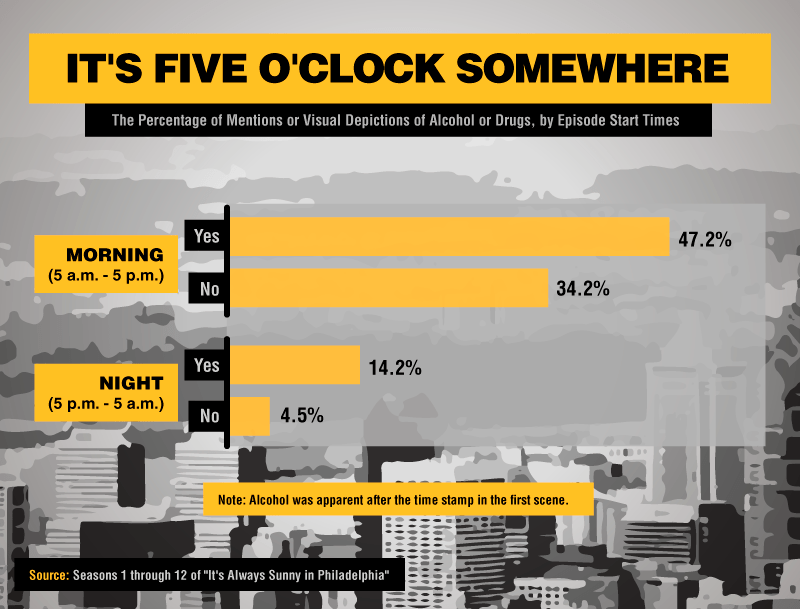 In reality, episodes like “Chardee MacDennis” (where “The Gang” plays its own made-up drinking game in 15-minute intervals) clearly illustrate binge drinking. As one of the most common and deadly forms of excessive alcohol use in the U.S., binge drinking can come with serious health risks, such as unintentional injuries, chronic diseases, and alcohol dependence. When it comes to substance use (and often, misuse), one character stands out among the rest as potentially being the most debaucherous of the group. 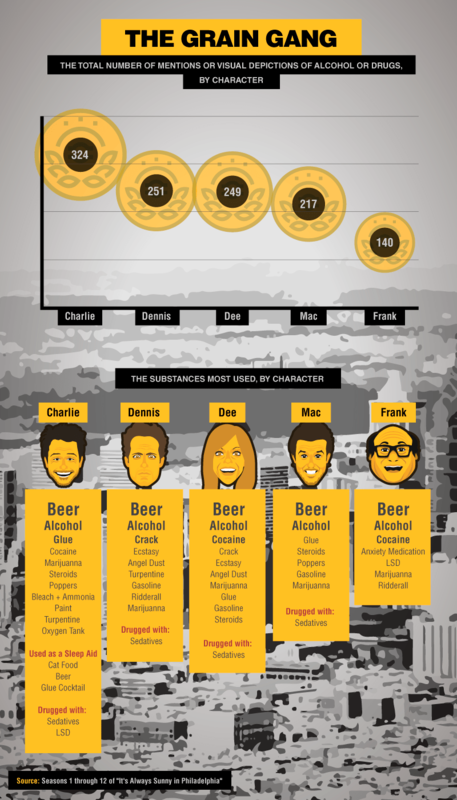 Over the course of the show’s 12 seasons and 134 episodes, every member of “The Gang” has consumed drugs or alcohol at least 140 times, and for some (Dee, Dennis, and Charlie), that figure roughly doubled. While the most common substances used were beer and other alcohol, marijuana made an appearance with each character at least once, and cocaine had cameos for 3 out of 5 main characters. Charlie, whose substance use includes steroids, poppers, and inhalants like glue and paint, had the highest rate of drug and alcohol use – 324 visual depictions. Addiction is a fairly common theme on “It’s Always Sunny in Philadelphia.” In “Dennis and Dee Go on Welfare,” the siblings quickly become dependent on crack while purposely attempting to fail a drug test, and Charlie is depicted having been dependent on inhalants since he was young. In “The Gang Gets Quarantined,” the main characters start to experience symptoms of alcohol withdrawal while attempting to avoid a flu pandemic, highlighting the reality that all five members are deeply dependent on alcohol. While often used to humorous effect on the show, the reality is not a laughing matter. Roughly 17 million American adults currently have an alcohol use disorder (AUD). Symptoms can include cravings, spending an excess time drinking, drinking longer or more than intended, and experiencing unexpected (and sometimes dangerous) outcomes as a result – all behaviors exhibited by the main characters on “It’s Always Sunny.” Like AUD, alcohol withdrawal syndrome is also a real issue and can occur as early as six hours after a person’s last drink. Symptoms of AWS can include tremors, anxiety, nausea, and vomiting. In some cases, AWS can be a serious emergency requiring professional or medical attention. 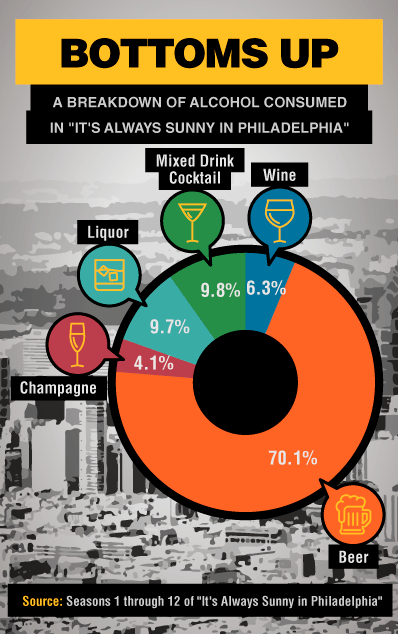 So what exactly are the characters on “It’s Always Sunny in Philadelphia” drinking? As the owners of a bar, it stands to reason they might have unlimited access to beer and liquor. Over the show’s 12 seasons to date, more than 70 percent of every drink taken on screen has been beer, while nearly 10 percent was hard liquor or mixed drink cocktails. Where alcoholic beverages are concerned, the type of drink can be just as important as how much or how often it’s consumed. The National Institute on Alcohol Abuse and Alcoholism (NIAAA) defines a standard drink differently depending on what it is and the alcohol content it carries. While a single glass of regular beer (typically 12 fluid ounces) classifies as a standard drink, beverages with higher alcohol content should be consumed more sparingly. Between 8 and 9 fluid ounces of malt liquor make up a standard drink, and only 5 fluid ounces of wine is equivalent to 12 fluid ounces of beer. A standard drink of hard liquor (including tequila, vodka, and whiskey) is reduced to only 1.5 fluid ounces. Based on these conversions, low-risk drinking by the NIAAA is defined as no more than three drinks per day for women and no more than four for men. Each new season of “It’s Always Sunny in Philadelphia” brings unique outrageous escapades for “The Gang,” new levels of controversy or political incorrectness, and different variations of intoxication. 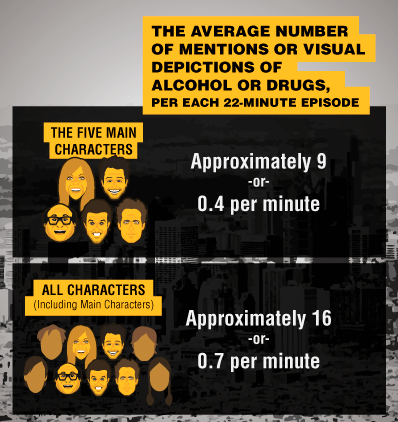 The use or mention of drugs and alcohol peaked in season 10, with more than 31 occurrences, on average, each episode. In “Mac Kills His Dad,” the recurring character Bill Ponderosa threatens to drink to death. In “The Gang Beats Boggs,” Dennis, Dee, Charlie, and Frank attempt to beat a drinking record of 70 cans of beer on a cross-country flight. As a result of their excessive consumption, Charlie and Dee experience hallucinations, and Frank almost kills a college student with a lethal dose of sleeping pills. Season 10 of “It’s Always Sunny” may take the proverbial cake for its use of drugs and alcohol as a comedic device, but before that, the show’s first season set the tone for years to come. With nearly 21 uses and mentions of drugs and alcohol per episode on average, episodes like “Underage Drinking: A National Concern” promotes underage drinking among teens. Even in “The Gang Finds a Dead Guy,” a bar patron is found dead one morning after drinking too much. Nearly every season of “It’s Always Sunny” had a standout episode that eclipsed the others in its portrayal of addictive substances. 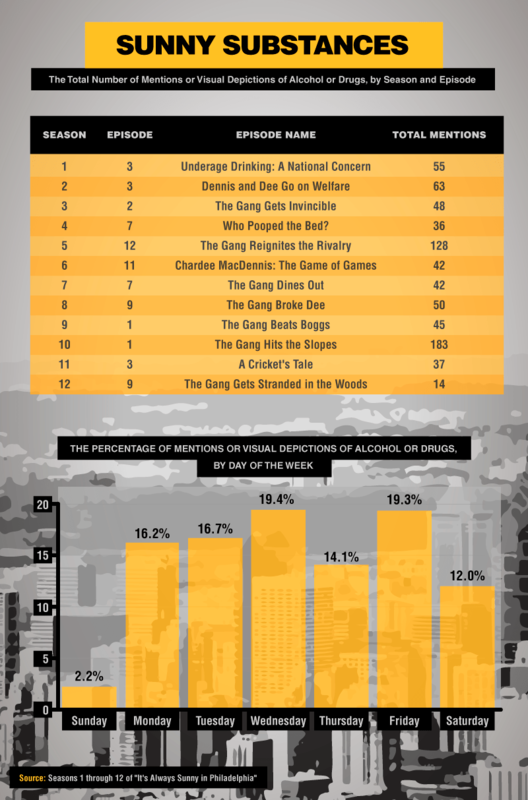 In season 10, “The Gang Beats Boggs” racked up the all-time highest number of mentions or appearances (183) of drugs and alcohol when Charlie and Dee each drank 70 cans of beer on a flight to Los Angeles. Frank became unconscious after his 19th beer, and Dee passed out at 29 but awoke and took uppers to stay in the “game.” Before season 10, “The Gang Reignites the Rivalry” in season five included 128 mentions or visual representations of drugs and alcohol. Like other episodes with high counts of drug and alcohol use, this episode involved a fictional drinking competition involving the game flip cup. To further complicate substance use, Dennis and Frank partake in some “Riderall,” a seemingly fictional version of Ritalin and Adderall. Americans who drink moderate amounts of alcohol typically drink more on the weekends than during the week. We found that wasn’t exactly the case with “The Gang.” Wednesday usually involved the highest rate of drug and alcohol use, followed by Friday and Tuesday. Across the U.S., the face of excessive alcohol use is changing. A person who is dependent on alcohol may not necessarily only drink on the weekends or binge drink in every sitting. In reality, what might look like a moderate level of consumption can quickly morph into an excessive pattern of drinking. High-risk drinking has increased by 30 percent among Americans in recent years, and when drinking starts to interfere with life, work, or relationships, it could be a sign of alcohol misuse. In the same way that the show’s main characters drank more during the week than on the weekend, they were more likely to drink before 5 p.m. than after 5 p.m. Nearly half of the episodes set in the morning hours of the day showed alcohol consumption immediately following the time stamp in the first scene, while less than 15 percent of episodes set in the evening did the same. When it comes to shocking episodes, “It’s Always Sunny in Philadelphia” makes a point not to shy away from controversy. With no shortage of terrible moments, our research found drugs and alcohol appeared at an alarming rate across all 12 seasons of the show, and it doesn’t seem to be slowing down. While often utilized as absurd antics to make viewers laugh, the excessive drinking patterns of “The Gang” often align with that of people who have become dependent on substances – occasionally by their own admission. In reality, alcohol dependence is no laughing matter. If you or someone you love is suffering from alcohol misuse or addiction, help is here for you. At Alcohol.org, we know alcoholism is a disease that manifests itself in the form of physical dependency and finding treatment won’t be the same for everyone. With resources to help you identify the root cause of alcoholism in your life and recommendations you can trust from some of the best care centers in the country, we’re here to guide you through every step of recovery. 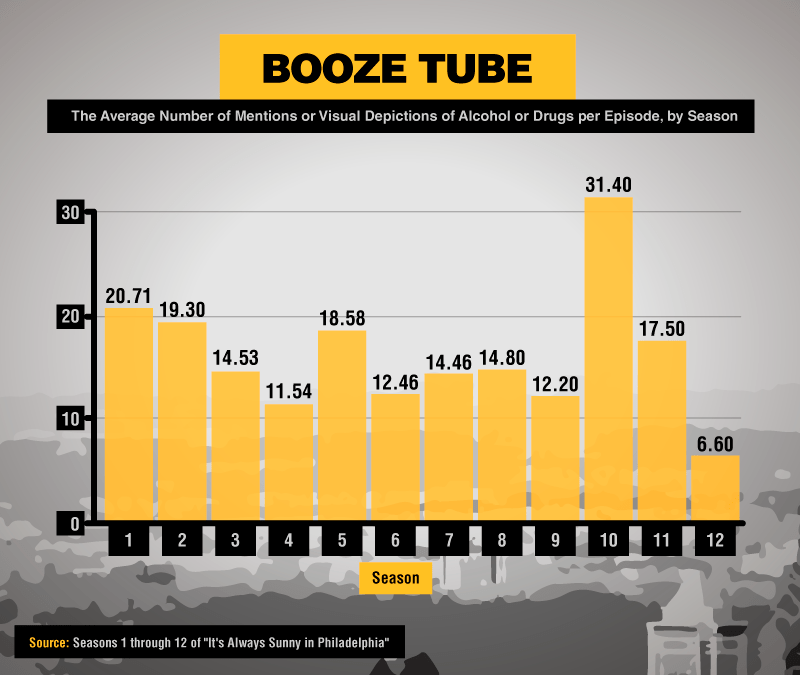 We watched and recorded minute details from every single season and every single episode of “It’s Always Sunny in Philadelphia.” Every mention and visual instance of alcohol and drug consumption were recorded. Additional factors, such as the time of day, day of the week, location, and characters involved, were also closely monitored and recorded.